Providing you the best range of victor serving coffee set and pearl tea set with effective & timely delivery. Fostered with vast industry experience and knowledge of this domain, we are engaged in presenting Victor Serving Coffee Set. Valued as an ideal blend of style and comfort, the offered serving set is largely used in hotels, restaurants, eateries. The offered serving set is designed and manufactured under the guidance of our deft professionals by utilizing fine quality material and insulated flask. Additionally, we are offering this serving set to the clients at the leading market prices. To meet the diversified requirements of our prestigious clients, we are engaged in offering Pearl Tea Set. 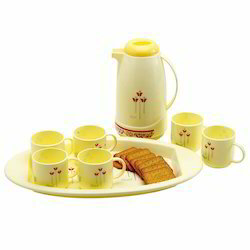 The offered tea set is largely used for serving hot tea to the patients in hospitals or employee in the office. At commercial and domestic sectors, the tea set has been accepted as the perfect tool used for various related series. Provided tea set is designed and manufactured by adroit professionals using premium grade materials with the aid of sophisticated techniques.